Attorney General Maura Healey announced a lawsuit against Purdue Pharma, maker and marketer of prescription opioids, after an investigation showed over 670 Massachusetts residents have died from their drugs. 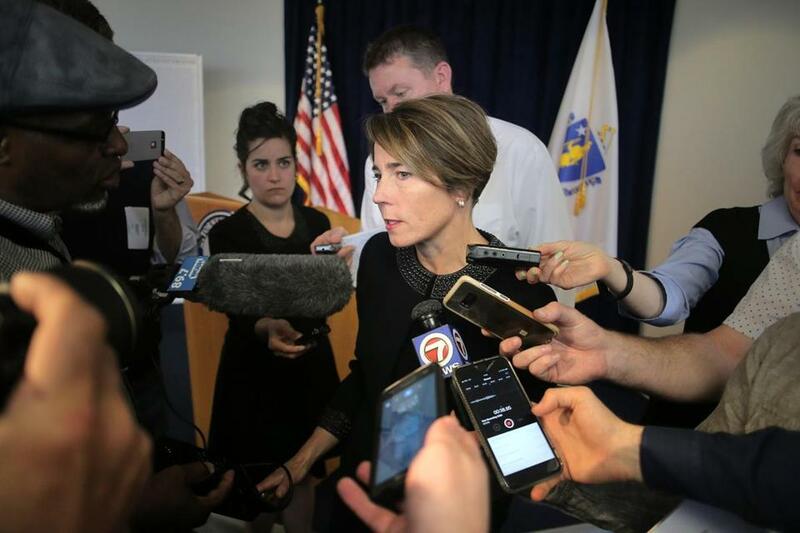 Attorney General Maura T. Healey sued OxyContin maker Purdue Pharma on Tuesday, alleging the company and its executives knowingly engaged in a “unconscionable” scheme to mislead doctors and consumers about the deadly dangers of its opioids. She asserts that the privately held company and 16 of its key directors and executives actively obfuscated the truth about opioid use, downplaying the perils of addiction and overdoses with the aim of getting more people to take them at higher doses for longer periods of time in order to boost the business’s bottom line. “Purdue Pharma created the epidemic and profited from it through a web of illegal deceit,” the lawsuit alleges. In a statement Tuesday, Purdue denied the allegations against it. While several other state attorneys general have taken similar legal action against Purdue, Healey’s action Tuesday opens a new front in the battle against the scourge of overdoses in Massachusetts. And the suit, filed in Suffolk Superior Court, hints the state could be seeking damages to the tune of billions of dollars. “We found that Purdue misled doctors, patients, and the public about the real risks of their dangerous opioids, including OxyContin,” Healey said at a news conference, standing next to officials including Governor Charlie Baker as well as families who have lost loved ones to overdoses. “Their strategy was simple: The more drugs they sold, the more money they made — and the more people died,” Healey said. An investigation by Healey’s office found that since 2009, 671 people who filled prescriptions for Purdue opioids in Massachusetts subsequently died of an opioid-related overdose, the legal complaint says. The oldest died at age 87. The youngest began taking Purdue’s opioids at 16 and died when he was only 18. Using internal Purdue documents, the 77-page civil action lays out a detailed case that Connecticut-based Purdue Pharma LP and Purdue Pharma Inc., as well as 16 current and former directors and executives, led a widespread deception, contributing to the epidemic in Massachusetts. Among those named are members of the Sackler family which owns Purdue. Based on more than 1 million pages of evidence gathered in her investigation, the attorney general alleges that Purdue misled doctors and patients thousands of times, successfully boosting sales as it was continuously sowing the seeds of the state’s ongoing overdose cataclysm. Since May 2007, Purdue salespeople met with Massachusetts prescribers and pharmacists more than 150,000 times, the lawsuit says. It cites several different doctors Purdue allegedly targeted, with sales representatives pressing the prescribers to dole out more and higher doses of the company’s opioids. And, it alleges that Purdue also peddled falsehoods to steer patients away from safer drugs than opioids. “Purdue not only lit the fire that killed so many patients; it also blocked the exits that patients could have used to escape,” the complaint states. The company also said it “vigorously” denies Healey’s allegations. “The attorney general claims Purdue acted improperly by communicating with prescribers about scientific and medical information that FDA has expressly considered and continues to approve. We believe it is inappropriate for the Commonwealth to substitute its judgment for the judgment of the regulatory, scientific and medical experts at FDA,” the statement said, referring to the US Food and Drug Administration. At the news conference, Healey stood next to six large panels of tiny text with the first names of Massachusetts residents lost to opioid-related overdoses since 2008. In Massachusetts in 2017, there were more than 2,000 opioid-related overdose deaths, the Department of Public Health has estimated. With the lawsuit, Massachusetts joins several other states that have already gone to court to take on Purdue. Meanwhile, more than 400 lawsuits against Purdue and other opioid drug makers and pharmaceutical distributors from cities, counties, and others have been consolidated in federal court. Cleveland-based Judge Dan Polster has issued an order scheduling three trials in the case for 2019. In 2007, Purdue and some of its executives pleaded guilty in federal court to criminal charges that they misled people about OxyContin’s risk of abuse and addiction, and were ordered to pay a $634.5 million fine. Earlier this year, Purdue announced that its sales representatives will no longer promote opioids to prescribers. In the newly filed Massachusetts lawsuit, the state is seeking findings of liability under three claims. The first is that Purdue and its executives and board members violated the state’s consumer protection statute, engaging in unfair and deceptive practices, including by making false and misleading claims about its drugs. The second is that the defendants created a public nuisance of addiction, illness, and death that interfered with public health. The third claim is negligence. The suit says Purdue owed a “duty of care” to patients, prescribers, and the state, and violated that duty. Massachusetts is seeking a change in practices as well as monetary relief to account for the harm caused.